An interactive image compressor and optimizer with many additional functions! JPEG Imager is an interactive image compressor. It provides a real-time preview of a compressed image and handy means to compare it with original one;You can fiddle with various compression parameters and observe the effect of changes almost instantly. You can also specify a desired file size and let the program select the proper value of the quality parameter automatically. Fast interactive compression to JPEG, PNG* or GIF* files and real-time preview of compressed image. 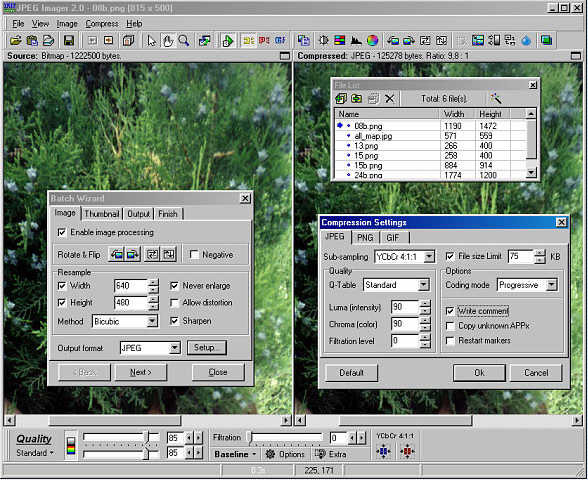 Various compression controls, synchronized Side By Side view and handy tools for image scrolling and zooming. Basic image manipulation and enhancing operations include: 1. Resampling (resizing), cropping; 2. Rotation/Flipping; 3. Brightness, Contrast, Gamma correction; 4.Levels adjustment; 5. Color balance, Tones adjustment; 6. Negative, Conversion to Grayscale; 7. Convolution filters (Sharpen, Blur); 8. Cleaning. Image acquisition from scanners or digital cameras via TWAIN and simple built-in batch processor and thumbnail generator. High compression ratio with good picture quality, Separate quality controls for luminance and chrominance and Flexible setup of color components subsampling. Progressive mode supported, Selective extra-compression mode and Fit to file size feature - automatic quality adjustment. Ultra Jpeg Tagger - A utility that takes advantage of a standard ability of JPEG files to store text comments. PixSmart Digital Imager - Makes working with your digital images easy. Photofit Harmony - Perfect panoramic photo stitching software. PhotoCool - The Best Digital Photo Printing Software! RasterVect - Powerful Raster to Vector conversion software. 3D Maker - Transform 2D graphics to stunning 3D within seconds! ACA Capture - An advanced screen capture software. AVD Graphic Studio - Editor for graphics, animation and video. Image Converter - Convert images to Bmp Gif Ico Jpg Png Tiff Wmf. SnagIt - The most complete screen capture software ! Smart Digital Photo - Visualization and working with images. Trellian Button Factory - Button Maker to creat Web Button easily. UniView - View, convert and manipulate all kinds of images easily! VicMan's Photo Editor - Award-winning PICs editor with cool interface.